part of terraced house, 4 - 5 people, 3 room/s, 2 bedroom/s, 1 bathroom/s, approx. 76 m², 2 floor/s. Bedroom 2: (floor 1, room without door): 3 x single bed at the 'hems/loft'. Kitchenette: Kitchen/ cooking equipment: 4 electric plates, oven, refrigerator, coffee machine, water boiler, freezer box approx. 300 litre. in the living room (ground floor). Living room: (ground floor): furniture suite. From the living room stairs to the gallery with sleeping facilities, see bedroom n° 2. Bathing jetty/bathing: landing jetty (shared use) in approx. 100 m.
Estate: (shared use with holiday guests): open plot, natural surroundings, meadow. Information on the boat(s): Motor boat (15.0 hp; 14.0 foot; approx. 100 m distant; payment, on order). Arrival: Airport Bergen Flesland in approx. 185 km. Ferry port Bergen in approx. 186 km. Train station Flåm in approx. 109 km. Beach/waters: Fjord (bathing possibility) in approx. 70 m (Sognefjord). Bus stop: Bus stop in approx. 130 m (Dragsvik). Next village/town: Center Balestrand in approx. 9 km. Høyanger in approx. 54 km. 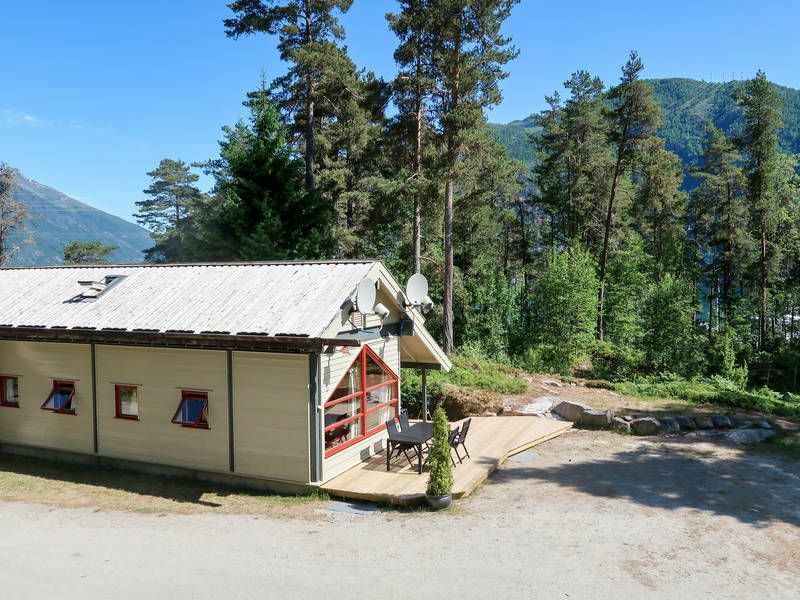 Sogndal in approx. 37 km. Shopping: Next supermarket (Balestrand) in approx. 9 km.